Make money with your website by accepting payments for listing submissions and for enhanced listings with custom fields and media. 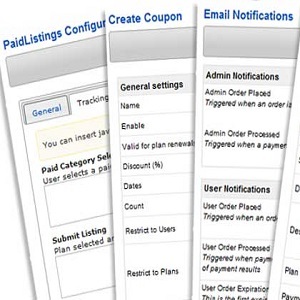 The Paid Listings add-on allows you to accept payments for submission of paid listings as well as listing upgrades. Use it for classifieds, real estate listings, city guides and more. Create new listing or upgrade plans, with one time or subscription payments and associate them with specific categories. Each plan can include a set of custom fields, a specific number of images and make the listing featured. The Add-on includes handlers for PayPal and 2Checkout as well as points handlers for EasySocial, JomSocial and AlphaUserPoints. The add-on integrates seamlessly with JReviews without the need for theme changes. The JReviews admin already has theme changes necessary to show pay-related info of listings in the moderation and browse screens.